Freight Factoring for Trucking | Match Factors, Inc.
We Turn Freight Bills Into Cash. Match Factors provides motor carriers and owner-operators in the US with 95% or higher cash advance transportation factoring solutions. Stop waiting 30, 60, or 90 days to get paid. Our transportation factoring program turns your freight invoices into cash and lets you focus on what you do best-- moving freight-- while we manage your accounts receivable. No hidden fees or monthly volume conditions. You'll receive additional benefits including access to our online account management system, discounts on fuel, and same day invoice funding. 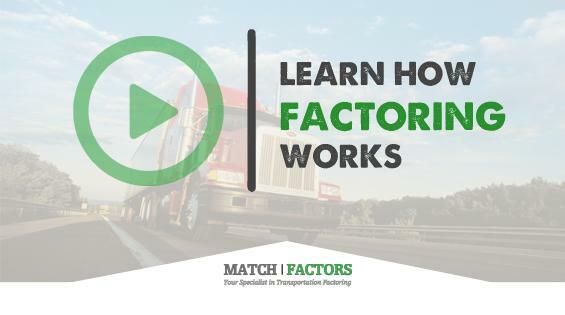 Here are just a few reasons why clients prefer factoring freight invoices with Match Factors. Tired of waiting to be paid? We'll pay you more for your freight bills. Get paid the same day you submit your invoices to us! No hidden fees, volume conditions, or long-term contracts. We know our clients by name, not by account number. Take advantage of significant fuel discounts at all major truck stops. Our team has 100+ years of combined experience. Put it to work for you. Get your 95% or higher cash advance. Find out what sets us apart from the competition. Learn everything you need to know in this guide.